For the bride and groom, a wedding reception is the culminating celebration with family and friends. It can also be a time of social stress, produced by romantic anticipation, second guessing and ill-fated dates. 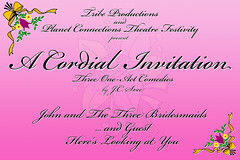 You are cordially invited to witness three such incidents.